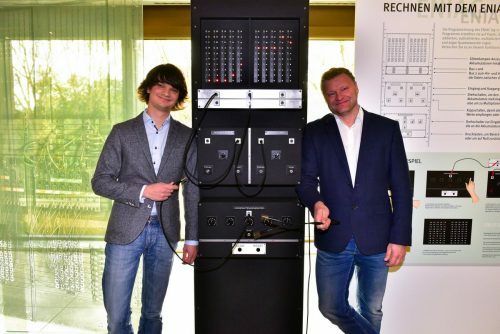 The 2016 Tony Sale Award for computer conservation has been won by the Heinz-Nixdorf MuseumsForum (HNF) for its evocative and educational reconstruction showing how ENIAC, one of the first electronic computers, was programmed. The Tony Sale Award, managed by the Computer Conservation Society and sponsored by Google, recognises achievements in the growing area of computer conservation. 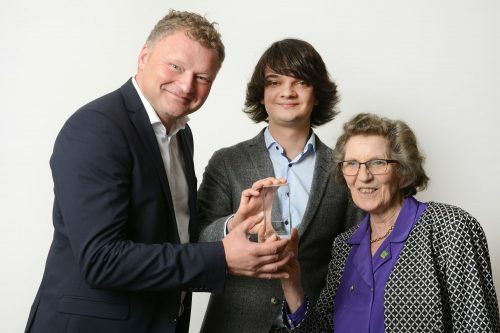 In the photo are Dr Jochen Viehoff and Johannes Blobel (the younger of the two) from Heinz-Nixdorf MuseumsForum and Margaret Sale, widow of the late Tony Sale. ENIAC was programmed by plugging wires and turning knobs, a physical skillset quite different from those deployed today. The reconstruction of part of the huge 1946 American computer has the look and feel of the original, but has been simplified to make it readily understood and even programmable by non-specialists. The inspiration for the reconstruction was the HNF’s Ada Lovelace bicentenary celebration – the ENIAC was originally mostly programmed by women. Operating six days a week in the museum, the reconstructed ENIAC accumulator (the ‘register’ in modern terminology) is safe and robust enough to be operated unsupervised by visitors. Other entries shortlisted for the 2016 award included a restoration of a 1972 PDP-12 computer by the Rhode Island Computer Museum; the conservation of a 1980’s IBM 30684 computer in the Jim Austin collection in York, England; and the restoration of a 1960’s computer peripheral, an IBM 1403-N1 printer at the Computer History Museum in California. Established in 1989, the Computer Conservation Society (CCS) started as a joint venture between BCS, The Chartered Institute for IT, the Science Museum and later the Museum of Science and Industry in Manchester. In recent years, The National Museum of Computing has become a key partner. Martin Campbell-Kelly, computer historian, was joined in the 2014 panel of judges by Chris Burton, engineer and computer conservationist, Nigel Sale, computer scientist and son of Tony Sale, and Doron Swade MBE, museum curator and author. Tony Sale (1931-2011), in whose honour the computer conservation award has been established, is perhaps best known for leading the team that rebuilt Colossus, the World War II code-breaking computer. He was also a key figure in starting the campaign to save Bletchley Park in the early 1990s, he co-founded The National Museum of Computing and jointly established the Computer Conservation Society.